PSA (Pressure Swing Adsorption)is an advanced air separation technology. It remains an irreplaceable standing in site gas supply field. Adsorbing material is the core in PSA nitrogen generator, the Carbon molecular sieve(CMS)is be chose as the adsorbing material generally, it can adsorb the oxygen ,carbon dioxide and water etc. not including the nitrogen gas. Two adsorption towers, tower A and tower B, are equipped with special carbon molecular sieves. As clean compressed air flows towards outlet, passing through CMS in tower A, O2, CO2 and H2O are adsorbed and nitrogen flows out from adsorption tower outlet. CMS in tower A becomes saturated as time goes by. At this moment, tower A stops adsorption and compressed air enters tower B, tower B continues oxygen adsorption and nitrogen production. Meanwhile, CMS in tower A begins regeneration. 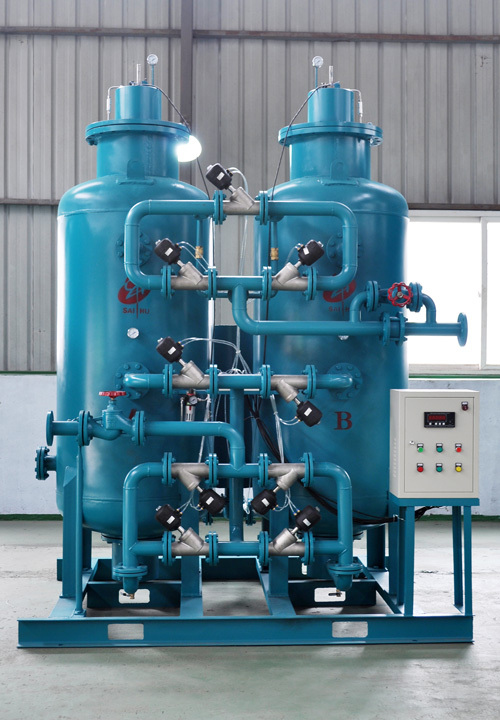 CMS regeneration is realized by lowering adsorption tower pressure to normal pressure and removing adsorbed O2, CO2 and H2O. Two towers make alternate adsorption and regeneration process and separate nitrogen from air and continuously produce nitrogen. This process is controlled by programmable logic controller (PLC). When outlet nitrogen purity does not reach set value, PLC activates, automatic discharge valve opens to empty unqualified nitrogen, which ensures unqualified nitrogen not to reach end user. Silencer reduces air discharge noise to less than 85dBA. Looking for ideal PSA Nitrogen Generator 99% Purity Manufacturer & supplier ? We have a wide selection at great prices to help you get creative. All the Purity 99% Nitrogen Generator are quality guaranteed. We are China Origin Factory of PSA Nitrogen Generators. If you have any question, please feel free to contact us.